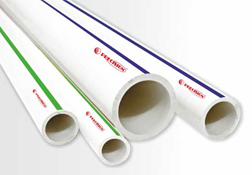 Precision ASTM (UPVC) Pipes & Fittings are manufactured from a specially formulated unplasticised polyvinyl chloride compound. These pipes & fittings are tough and durable with high tensile and impact strength and are manufactured in accordance to ASTM D – 1785 SCH 40 & SCH 80 and fittings to ASTM D 2467 – SCH80. Channelising potable water supply in Homes, Apartments, Hotels, Commercial Complex, Hospitals etc. • Various diameters & grades to suit different application & condition • Time tested operational life of 50 years • Economical, Maintenance free & Easy to install • Heat Efficient & Lower Installation Cost • Corrosion free & Chemical resistant • Fire Retardant • Low Thermal Expansion • Hygienic & Environment friendly • Services Temperature upto 60° C.